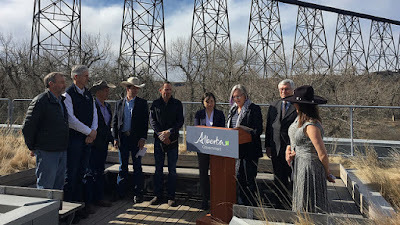 Government of Alberta - The province is providing nearly $9 million to three non-profit groups to protect ranchlands, river habitats and watersheds in southern Alberta. Funding from the Alberta Land Trust Grant Program will go towards six projects throughout southern Alberta, including three large ranches. The grants protect watersheds and wildlife habitats and help keep ranchlands intact. The Nature Conservancy of Canada will receive $5.1 million to support the protection of one ranch in the Castle-Crowsnest watershed and another in the Bow area. Together, these projects will conserve 6,000 acres (2,430 hectares) of working ranchland. The Southern Alberta Land Trust Society will receive $3.2 million for three projects, including the organization’s largest ever – a 3,995-acre (1,600 hectare) ranch in the Pekisko Valley near Longview. Other money will go to protect 907 acres (367 hectares) of wildlife habitat and watershed areas in the Porcupine Hills and near Waterton Lakes National Park. The Foothills Land Trust, which focuses south and west of Calgary, will use its $478,000 grant for a conservation easement on between 260 and 320 acres (105 to 130 hectares) of river valley and riparian habitat along Fish Creek northeast of Priddis. The Alberta Land Trust Grant Program supports projects that ensure stewardship of private lands by outright purchase or through legal agreements to safeguard agricultural, environmental and recreational landscapes from most types of development. Five other land trust organizations will also receive funding this year from the program. In total, the eight organizations will help conserve 14,000 acres (5,600 hectares) of privately owned land. For every dollar the Alberta government provides to these projects, the applicant must provide two dollars in value. Over the previous six years of grants, $48 million worth of grants have been awarded to nine different land trusts to conserve more than 93,900 acres (38,000 hectares) of land.